Sorry, there are no shows on sale at Aldwych Theatre right now. The Aldwych Theatre is a West End theatre, located on Aldwych in the City of Westminster. The theatre was listed Grade II on 20 July 1971. Its seating capacity is 1,200 on three levels, a fairly large auditorium. 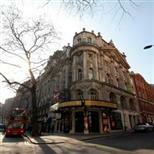 The Aldwych Theatre is amongst the many theatres that are reported to be haunted. The Aldwych theatre opened on 23 December 1905 with a production of Blue Bell, a new version of Hicks' popular pantomime Bluebell in Fairyland. In 1906, Hicks' The Beauty of Bath, followed in 1907 by The Gay Gordons, played at the theatre. In February 1913 the theatre was used by Serge Diaghilev and Vaslav Nijinsky for the first rehearsals of Le Sacre du Printemps before its controversial premiÞre in Paris later that year. In 1920, Basil Rathbone played Major Wharton in The Unknown. From 1925-1933, it became the home of Ben Travers's farces, also known as The Aldwych Farces. Members of Travers's company included Ralph Lynn, Tom Walls, Yvonne Arnaud, Norma Varden, Mary Brough, Winifred Shotter and Robertson Hare. In 1933, Richard Tauber presented and starred in a new version of Das Dreimõderlhaus at the Aldwych under the title Lilac Time. From the mid-1930s until about 1960, the theatre was owned by the Abrahams family. On 15 December 1960, after intense speculation, it was announced that the Royal Shakespeare Company of Stratford-upon-Avon was to base its London productions in the Aldwych Theatre for the next three years. In fact they stayed for over 20 years, finally moving to the Barbican Arts Centre in 1982. Among many notable productions were The Wars of the Roses, The Greeks, and Nicholas Nickleby, as well as numerous Shakespeare productions. During absences of the RSC, the theatre hosted the annual World Theatre Seasons, foreign plays in their original productions, invited to London by the theatre impresario Peter Daubeny, annually from 1964 to 1973 and finally in 1975. For his involvement with these Aldwych seasons, run without Arts Council or other official support, Daubeny won the Evening Standard special award in 1972. In 1990-91, Joan Collins starred in a revival of Private Lives at the Aldwych. The theatre is referred to in Julio Cortßzar's short story Instructions for John Howell (Instrucciones para John Howell) in the anthology All Fires the Fire (Todos los fuegos el fuego). Since 2000, the theatre has hosted a mixture of plays, comedies and musical theatre productions. Andrew Lloyd Webber's musical Whistle Down the Wind played until 2001, and Fame enjoyed an extended run from 2002 to 2006. From 2006 to 2011, it was the home to the British musical version of Dirty Dancing. The nearest Tube stations are Covent Garden/Holborn/Charing Cross. All major London stations connect with the tube. The Theatre is well served by buses with the following routes stopping within easy walking distance of the Theatre - 1,4,11,13,15,68,98. The venue recommends that you use Q-Park's Theatreland parking scheme. Please visit www.q-park.co.uk for details. The theatre has wheelchair access, please contact them to discuss your requirements. An FM assisted listening system is available for people with hearing impairments. A returnable deposit of ú25 is requested. Guide dogs are welcome and can be looked after if required.